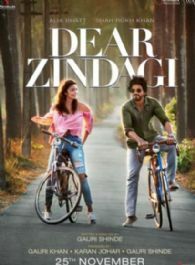 Dear Zindagi is a 2016 Indian drama film directed by Gauri Shinde and produced by Gauri Khan, Karan Johar and Gauri Shinde under the banners of Red Chillies Entertainment, Dharma Productions and Hope Productions respectively. It stars an ensemble cast of Alia Bhatt, Ira Dubey, Kunal Kapoor, Ali Zafar, Angad Bedi and Shah Rukh Khan. Alia Bhatt is truly dedicating herself to Gully Boy and Here's How! Do you know who is Alia Bhatt's favourite actor?